"The bubbles popped and crinkled their fragrantly smiles upward along the peach-colored tile. My notebook and pen sat ready and waiting for my reflections, as did my fresh cup of coffee sweetened with cream and sugar. Kathleen Norris and Sarah Ban Breathnach promised me counsel. It was all so inviting and intimate. "It was my oldest son on his way over the bridge to a college final. He needed to hear a 'friendly voice' before meeting his assumed doom. The poor child suffers text-anxiety. Passing the class hinged on this final test grade. Never a good thing. “ 'I need prayers, Mom.' It was the voice of someone on his way to the guillotine." Read the rest HERE and leave me a comment at the site. She's seven but I decided that she was old enough to start chopping and dicing using a "real knife." The Pampered Chef paring knife is child-friendly but it made her feel so big and important. This was a big deal! "Mommy, I'm so good, aren't I? I've never had so much fun in my life! Slicing things up is neat!" Okaaaay! What am I encouraging here? Tell me. She also felt very superior taking over her sister's job of stirring a very hot pot of olive oil, sliced tomatoes, minced garlic, diced bell peppers and chopped onions. Who needs a vocabulary list and a home ec classroom when you explain the different cutting methods while the child is chopping in your kitchen? Please excuse the pajama to clothes change in the middle of this production. We don't stay in our pajamas all day long. Really...we do change eventually, even if it isn't until 4:00 PM. Have I mentioned lately that we are homeschoolers? Annie dicing and arranging the carrots on the salad. Annie cutting and layering the pears. Annie sliding the garlic bread into the heated oven. What a delicious looking salad. It wasn't our regular Great Depression fare but it was another Class A meal at the Cajun Cottage! Yummy! Part of our Great Depression unit study is to cook the recipes offered at Great Depression Cooking with Clara. Tonight's dish was Peppers and Eggs. Chelsea re-watched the video clip and cooked it. We used butter instead of cooking grease and added some chopped onions and sprinkled a bit of grated cheddar cheese on top. We did not add any salt to it but got a ridiculous delight in watching this 90+ yr-old woman add extra salt to hers. I have to say I was stunned...stunned, I tell you...at how delicious this dish was/is. I could eat it every day, I think. Which gave me greater reason to be disappointed in my 21st-century children who refused to partake of this Depression banquet. Only I ceased being disappointed in them with the first diaper change. Corey bravely...grudingly...stubbornly...resisted until I got the fork to touch his lips. Then he obliged. "We aren't living in a Depression, Mom." "Oh, yes, we are. Haven't you watched the news?" "Well, last I checked, Burger King was still open..."
Kayleigh called from work to see if I was cooking because Kei's mom was and should she come home or...? I enthusiastically explained that her sister was cooking a Great Depression meal and Wednesday nights would serve the dish. Tonight was Peppers and Eggs. There was a pause. Then..."Don't you think you're taking this thing a little far, Mom?" Beastly young adults-slash-teenagers! They spoil all the fun. The younger group wasn't much better. Garrett raided the refrigerator, Chelsea claimed exemption because she was the cook, and Annie was just plain defiant and settled on her regular scrambled eggs w/ cut-up ham. Mark and I thought it was simply delicious. And then there was the pie. The dessert pie. The blueberry dessert pie. Everyone ate the pie. Which Annie and Chelsea diligently stabbed to death. I think they learned that you should never over "pine-tree" because it then breaks the baked crust. Ah, well, we bake and we learn. The blueberry pie and fresh whipped cream was in recognition of today's Catholic feast day: The Feast of the Annunciation. The day Mary said "Yes!" to God's request that she bring forth the Son of God into the world. She could have said "No!" and where would we all be today? My husband called on the way home from work. "Need anything?" "Yeah, could you stop and pick-up some blueberries and a pie crust? 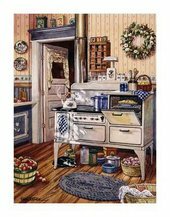 It's the Feast of the Annunciation and I saw that Cathy's doing a blueberry pie. I have a headache but that's easy enough to pop in the oven." "They're blue, honey. Blue is for the Blessed Mother." We have to tell our men-folk this. They just don't "get it." Blue is for a lovely lady, our heavenly Mother, who submitted her will to God's Almighty Plan. She had faith the size of a mountain. She did not know the plan or the future but she believed in a God greater than any plans she could make. This is the day, for all Christians, that God's word was made flesh. In the sixth month the angel Gabriel was sent from God to a city of Galilee named Nazareth, to a virgin betrothed to a man whose name was Joseph, of the house of David; and the virgin's name was Mary. And he came to her and said, "Hail, full of grace, the Lord is with you!" But she was greatly troubled at the saying, and considered in her mind what sort of greeting this might be. And the angel said to her, "Do not be afraid, Mary, for you have found favor with God. And behold, you will conceive in your womb and bear a son, and you shall call his name Jesus. He will be great, and will be called the Son of the Most High; and the Lord God will give to him the throne of his father David, and he will reign over the house of Jacob for ever; and of his kingdom there will be no end." And Mary said to the angel, "How can this be, since I have no husband?" And the angel said to her, "The Holy Spirit will come upon you, and the power of the Most High will overshadow you; therefore the child to be born will be called holy, the Son of God. And behold, your kinswoman Elizabeth in her old age has also conceived a son; and this is the sixth month with her who was called barren. For with God nothing will be impossible." And Mary said, "Behold, I am the handmaid of the Lord; let it be to me according to your word." And the angel departed from her. (Luke 1:26-38)"
Kayleigh gives her god-daughter an early cooking lesson. She makes this chicken/cornbread dish quite often. This morning she made a pan for the Thanksgiving dinner at her work place. I took notes. Mix your package of white cornbread and put to bake. While it is baking, cut chicken breasts into inch-sized cubes. Brown chicken in two tablespoon butter. Cook slowly and watch that it doesn't burn. When fully cooked, shred on plate. Lightly coat another pan with virgin olive oil and saute your Cajun Trinity and green onion. When cornbread is done baking, crumble it into large bowl. Leave your oven at 350 degrees. Mix sauted seasonings, chicken broth, and cream of chicken soup into cornbread. Blend completely. * Stir shredded/chunks of chicken into cornbread mixture and spread in pan lightly coated with cooking spray. Bake at 350 degrees for 20-30 minutes. * Kayleigh likes to add extra chicken broth to make her dressing moist. Add as little or as much as you desire. Excuse the condition of the pan. It was Meme's and it's well-used/well-seasoned. It's Kayleigh's favorite. Yum! Nanny sure can cook! Don't worry...I think it was pureed squash. Change of menu plans already. Monday night and there is still half a pan of leftover lasagna, a bowl of chicken-sausage gumbo, and plenty of beef roast and potatoes leftover...not to mention a plate of untouched baked sweet potatoes. I come from a family who taught me that wasting food is a sin. Tuesday night has become leftover night. We'll still have the apple pie and ice cream as the polls close. Thursday night is another late soccer game. Leftovers at Gibson Hut that night as well. Tonight I concocted my own recipe for this Top Round Steak. The B & B are for Barbecue & Beer. It's in the marinating state overnight. If it's any good, I'll post the recipe tomorrow. We'll be doing that sometime in October. The saying goes, "Ask and you shall receive." 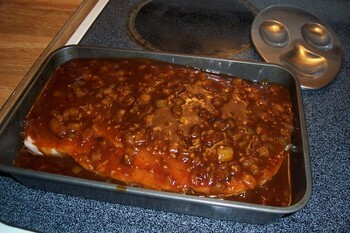 Bean Casserole---chop meat with taco seasoning and throw some beans in. Alternate tortillas, bean/meat mixture, and cheese. Brush with melted butter, then sprinkle with cinnamon sugar. Cut into wedges and bake until crisp. These also make great dippers with a chocolate pudding + cool whip type of combination. I think I had this at a Pampered Chef party. Another possibility is mu shu pork (take out or homemade) -- Mandarin pancakes are similar in composition to flour tortillas so they adapt beautifully. Just brush the tortillas with a bit of sesame oil before filling them and rolling them, then heat in a covered skillet. Another: use as crepes and fill with chicken and broccoli, or smoked salmon and scrambled eggs... bake, topped with cream sauce. More: Layer deli meats, cream cheese or mayo, and grilled veggies and/or lettuce, tomatoes, onions. Roll up and secure with toothpicks. Slice into 1-inch pieces. I layer meat, beans and cheese with tortillas and then I pour enchilada sauce over the whole thing. You can also make nice hors d'oeuvres we like what are called garlic bites. You mix garlic into cream cheese and then spread on a tortilla and roll 'em up. Refrigerate to set then slice into pinwheels. I've added other spices and such into it and they're great. 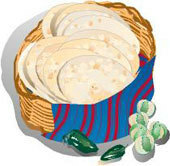 Also---very simple---tortillas make a great bread to go with any number of soups/stews. Fajitas is another use. Sliced meat (beef or chicken) cooked with spices and some sauted peppers and onions and the cold toppings of cheese, sour cream, lettuce, tomato etc. A standard lunch here is a cheese crisp - just top w/cheese and bake for a few minutes. Boil up some chicken breasts. Whenever I bring it to any potluck it goes like crazy. You can also just layer if you don't feel like rolling. You can also add in other things, like red pepper, or spinach, etc. And Jennifer reminded me of Alice's Tilma of Roses to serve during a Guadalupe Tea.